The company, which was founded only four years ago, is attempting to take on Tesla (TSLA) in China, the world’s biggest electric vehicle market. Its ES8 electric SUV, which was unveiled last year, sells for about $65,000, or about half the price of the most basic version of Tesla’s Model X in China. 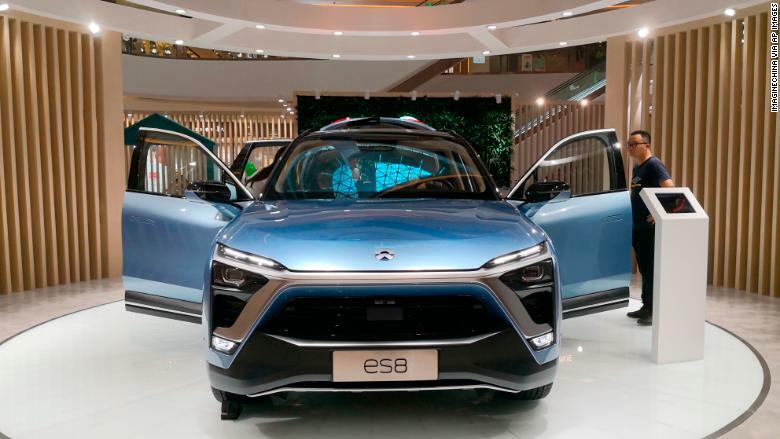 Nio’s ES8 electric SUV sells for about half the price of the most basic version of Tesla’s Model X in China. That’s easier said than done in China’s already crowded market. Nio intends “to compete with Tesla at a somewhat more affordable price,” said Bill Russo, founder of Shanghai-based consulting firm Automobility. It’s seeking to attract younger drivers with features like internet connectivity and artificial intelligence, he added. 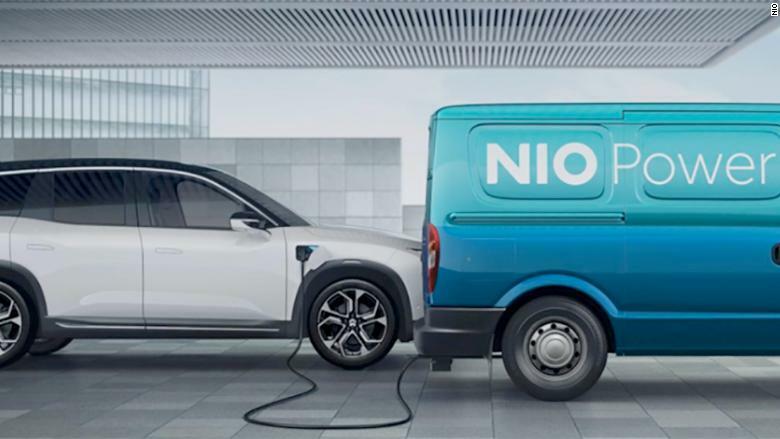 An artist’s rendering of Nio’s plan to use vans that function as mobile charging stations. By comparison, Tesla already has about $2 billion in annual sales in China even though its US-made vehicles face hefty import tariffs. Musk’s company is aiming to build a factory in Shanghai that will eventually manufacture as many as 500,000 vehicles a year. “If you look at the car, it’s no different from any other vehicle right now,” Le said, referring to the ES8. Nio’s business model could also be a disadvantage. Rather than making its own vehicles, it outsources manufacturing to an established Chinese car company, Anhui Jianghui Automobile Group (JAC). The company’s lack of direct control over the vehicle manufacturing makes it harder to maintain quality and respond to changes in consumer tastes, according to Le. The company is unable to get a license to open its own factory because it doesn’t sell enough vehicles yet, he said. Nio’s senior executives have big ambitions, though. 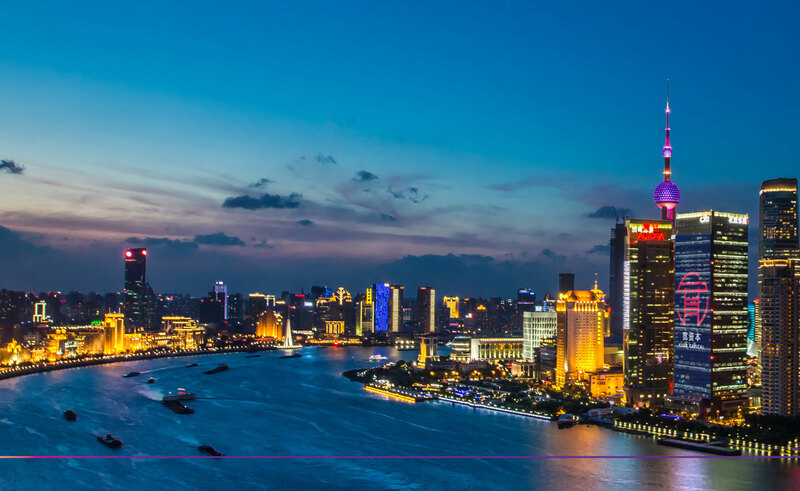 President Lihong Qin told CNN in December that it wants to “target the middle class in the big cities in China,” predicting that market will double in size in the next few years.